The pursuit of the ‘perfect’ body is not something new; one only needs to look at Classical Greek sculpture to realise that. And the idea that this kind of body exists and is attainable – if only we stick to the right diet – is a dangerous myth. Every week, it seems, a new diet hits the market that claims to do what the others have not. Diets promise so much yet deliver so little. They often neglect something called genetics, which is the main determining factor of our weight and shape. Long-term health and quality of life are also often overlooked by diets that focus on helping you achieve your ideal weight and shape, however unrealistic and unsustainable that is. To raise awareness of the dangers of dieting and the prevalence of poor body image and disordered eating in society, the Butterfly Foundation for Eating Disorders is launching Plate Up the Positives for the month of May. International No Diet Day on Monday, May 6th, marks the beginning of awareness activities for Plate Up The Positives. They want to hear from people who took part in raising awareness or fundraising activities to encourage people to develop a healthier, positive attitude to food, weight and shape. I spoke to the Butterfly Foundation’s Kathryn Courts to find out about the campaign and some of the work the Foundation does towards supporting and educating those suffering from eating disorders and poor body image. The Butterfly Foundation’s Plate Up the Positives campaign is running throughout May. The campaign, as Courts explained, is an opportunity to raise awareness of weight discrimination, how much society focuses on dieting and the prevalence of disordered eating and eating disorders. Given that the decade between 1995 and 2005 saw rate of disordered eating double, this is a serious issue which diminishes the life enjoyment of sufferers and their loved ones. It is estimated that 9% of Australians suffer from an eating disorder at some point in their life. 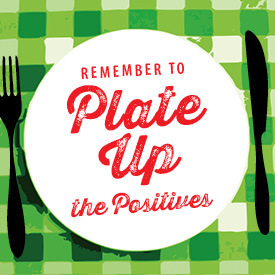 Plate Up the Positives encourages people to come together, share a plate and discuss attitudes towards diet and body image. ‘A day free from dieting’ Courts explains, which creates a positive environment in which people can talk about these issues, and perhaps acknowledge their own struggles. Sadly, in many cases, those suffering from an eating disorder do not feel able to talk about their illness with even their closest friends and family. At the same times, many sufferers are not aware that they have an illness, and believe that strict dieting and a fixation on shape is ‘normal’. By having a day free from eating, awareness is raised of just how much focus there is on dieting. ‘An eating disorder is a mental illness, not a lifestyle choice’ Courts emphasised (in fact, Anorexia Nervosa is the most fatal mental illness). She hopes that the Plate Up Positives campaign will contribute to dispelling some of the myths around disordered eating. This includes the belief that you have to be underweight to have an eating disorder and that dieting is normal. In fact, while sufferers from Anorexia Nervosa are generally quite underweight, those suffering from Bulimia Nervosa, Binge Eating Disorder or an Eating Disorder Not Otherwise Specified(EDNOS) can be underweight, a healthy weight or even overweight. Stereotypes also exist concerning the gender, age, class and ethnicity of sufferers. Although young women make up the largest group of sufferers, eating disorders affect people young and old, rich and poor, of both genders, and from all cultural backgrounds. The Butterfly Foundation does not advocate that dieting equals an eating disorder, but rather that dieting can make some people more vulnerable to developing an eating disorder (with young female dieters eighteen times more likely to develop and eating disorder than non-dieters). Such awareness is important given that so many people embark on strict diets and, in many cases, are unaware of the potential risks associated with dieting. Today, as Courts pointed out, ‘if you’re not on diet it’s kind of weird’. The multi-billion dollar diet industry certainly has a lot to answer for, as it reinforces negative body image and feelings of shame surrounding eating, weight and shape, and promotes dieting as a healthy lifestyle choice. Plate Up the Positives is just one of the ways the Butterfly Foundation supports those with eating disorders and poor body image. Its mission is ‘to live in a world that celebrates health, well-being and diversity’. 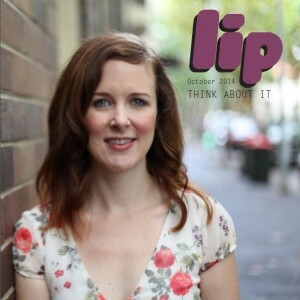 The Foundation offers support to eating disorder and poor body image sufferers through a telephone helpline (1800 ED HOPE / 1800 33 4673, Monday–Friday 9am to 5pm), face-to-face counselling, web counselling, support programs, education and early intervention programs, and their web community. For this campaign, people are encouraged to share photos of their Plate Up the Positives gathering and their personal experiences. This May, why not organise a gathering with friends, family or colleagues to enjoy a day without dieting and raise awareness of the emphasis on dieting and body image in our society? By creating a supportive environment you may encourage someone to seek help, or simply contribute to a greater understanding of eating disorders and the potential dangers of dieting. See the Butterfly Foundation’s website for more information about the ‘Plate Up the Positives’ campaign. If you would like help for yourself or a loved one, you can call the helpline: 1800 ED HOPE / 1800 33 4673 Monday–Friday 9am to 5pm, or email: support@thebutterflyfoundation.org.au. You can make a donation to support the Butterfly Foundation here. This is fab and really exciting. I spend a good proportion of each day tackling the diet industry and it is difficult – I write about my campaign at my blog also and when granted permission I publish the comments from the diet organisations I contact. I know there is so much great work going on out there to raise awareness and this campaign is much needed. After miserable decades of diets with the only effects being weight loss, weight gain, weight loss, weight gain, restriction, binge, compulsive eating and bulimia – I ditched dieting over a year ago now and haven’t stepped on a pair of scales in that time either, which is quite a big deal – I, like so many was obsessed with weighing myself and my food. So much of our relationship with food stems from our child hood development (there is extensive research in on this for example ‘Attachment Theory’). There are powerful psychological and emotional links to our eating which with further understanding and exploration we can learn not to use food to soothe ourselves or stuff down and distract us from difficult / painful feelings and emotions. Dieting doesn’t deal with these important aspects and so we generally put the weight back on. I started a petition recently asking the ‘Diet Industry’ in line with Advertising Standards to produce research into the efficacy of their diets and further more (this is not required by the AS Authority, but I believe is important) to advertise the research methodology and results within their merchandise, products, materials, groups and websites. The hypothesis being (which after 8 months of contacting the diet industry for research to back up their claims and promises, in my opinion is being proved more than just a hypothesis)that there is a distinct lack (or none at all) of credible research and in particular a lack of research into sustained weight loss. By proving this hypothesis, but more importantly by making it mandatory for the diet industry to substantiate their claim (that their diet works) as set out by the AS Authority “The Advertising Codes require that all claims must be substantiated before being published or aired” @ http://www.asa.org.uk/About-ASA/About-regulation.aspx – this will discredit the industry and provide consumers with a more realistic picture of these diets and their aims which I believe is to make money from consumers NOT sustaining weight loss. This entry was posted in Get Involved, Health and tagged anorexia nervosa, body image, bulimia nervosa, dieting, diets, eating disorder, mental illness. Bookmark the permalink.